On May 31, 1908, one of our most spirited and tenacious personalities, Carl Ferdinand August Mueller, died from a stroke in the Martinez County Hospital and was interred at Alhambra Cemetery in Martinez, California. August’s headstone and grave in the Alhambra Cemetery remains unclear as to whether he is in the Potter’s Field section or the main area of Alhambra Cemetery. The City of Martinez does not have a record of August’s burial site in either their Alhambra area or Potter’s Field listings. However, after being in contact with his great granddaughters, Kristin, Kathleen and Mary, and his great grand son-in-law, Don, we were glad to add August to our biographies. We are grateful to August’s direct descendants for giving us permission to use all the newspaper articles, pictures, and documents that they had in their possession. Without their help, August’s story could not be told. August Mueller stood at 5 feet 5 inches tall, was fair in complexion and had blue eyes and brown hair. He was born on January 28, 1846, in Elbing, Prussia to Jacob and Paulina Goeppinger Mueller. The city is now known as Elblag, Warminsko-Mazurskie, Poland. 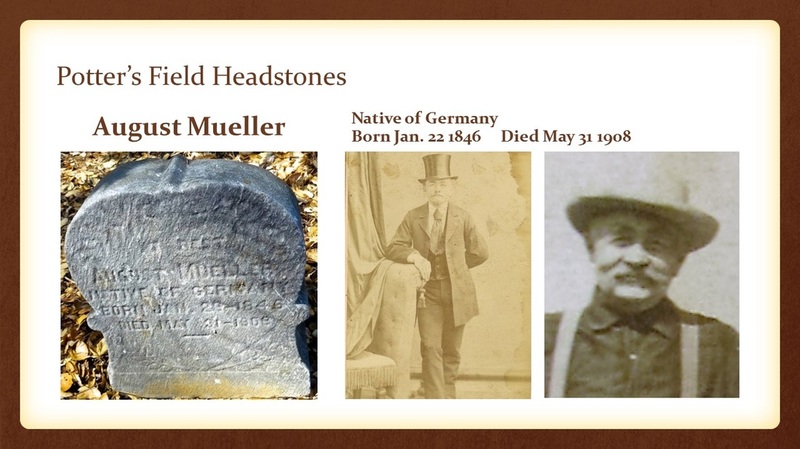 Records show that he had one brother, Wilhelm Mueller. His father, Jacob, passed away (in Prussia) when August was only 16. It is from information gathered on August’s pension papers, provided by his direct descendants that August entered the military in 1867 and served as a private, Company K, 12 US Infantry. This would have been during the reconstruction period after the American Civil War. In Lieutenant Charles W. Abbot Jr.'s book, The Twelfth Regiment of Infantry, he writes about the whereabouts and experiences August's might have encountered. Lt. Abbot gives us the idea that Company K was located in Washington (DC) in 1867. He begins "On January 18, 1868, Companies B. C, F and K, under Major Maynadier, proceeded by rail to South Carolina where stations were taken at Darlington, Georgetown and Beaufort. Afterwards Charleston and Summerville, S. C., Montgomery, Ala., and Fort Pulaski and Savannah, Gal, were occupied, and at the latter place on December 2nd Major Maynadier died. The duties performed in this locality during the reconstruction period were of a very trying and delicate nature, requiring as they did a combination of good sense, courage and forbearance." Lieutenant Abbot Jr. Gives us a clue about Washington, D.C. when he writes, "On April 5th Headquarters and Companies A, E, G and I left Washington by rail for Omaha, and proceeded thence by the Union Pacific Railroad to the end of its track. A march of 45 miles was made to the terminus of the Central Pacific railroad, where cars were taken to San Francisco..... "
The first mention of August heading to California is when Lt. Abbot Jr. states "Companies B, C, D, F, H and K, under Lieutenant-Colonel Wallace, left Washington, 10th, and proceeded west by the same route as that taken by the first detachment." He completes his facts by stating, "The other four companies reached Angel Island May 6th. Headquarters and Company G remained there. The other companies proceeded to posts as follows: .... E and K, Camp Gaston, Cal., ..."
One thing we learn from Lieutenant Abbot Jr. is the type of post Camp Gaston was, "The isolated posts were almost all at or near Indian agencies, which involved more or less work inspecting supplies, etc." Documents provided by the direct descendants show that he made Corporal in Company K, 12th Infantry by June 1, 1869 and Sergeant on December 1, 1869. Through more documents, it appears that August was honorably discharged from the army on June 29, 1870. Only three days after August became a citizen, he registered to vote. Provided by his direct descendants, on September 17, 1870, at the age of 25, August signed his first voter registration card in Humboldt County, California. On November 18, 1873, August signed his next California Voter's Registration. He is now 28 years old and a civilian merchant. On August 30, 1878, his eldest son is born, Gustave "Gus" Fredrick August Mueller in Livermore, California. According to his direct descendants he changed his last name to Muller. He was married to Mary Diercks Muller and they had one daughter named Maud. He was also a foreman at the Standard Oil (Chevron) Refinery in Richmond. However, Gus only outlived his father by 14 years. According to direct descendants and newspaper articles from the Richmond Daily Independent on October 16, 1922, “He was unfortunately killed on October 16, 1922, by a Southern Pacific switch engine on the Belt Line tracks, that he could not see or hear. The switch engine struck his automobile around 6am on a foggy day. He, and a fellow employee, were on their way to the Standard Oil gun club preserve to go duck hunting. Gus is buried in Sunset View (El Cerrito) Cemetery in California. On an unknown date a daughter was born to August and Katie. Her name was Amalia Mueller. It is believed she died in infancy. On October 1, 1880, August is listed in the California Voter's Registration and the U. S. Census of 1880 as living in San Francisco. He is 34 years old and living on 1232 Green Street in San Francisco. He is a clerk in the Post Office. His wife, Katie, is 21 years old and is keeping house. His son, Fred A. (Gustave Fredrick August) is 2 years old. On March 12, 1881, his daughter, Maud Frances Mueller is born in San Francisco, San Francisco County in California. According to Maud’s Affidavit of Birth, August was 36 years old and Katherine was 21 (though she was really age 22). Maud married Leonard George Bauer on June 7, 1905 in San Francisco. She had three children during her marriage: Leonard, Norman, and Frances. She died on March 21, 1945, in San Francisco, California, at the age of 64 and is buried in Holy Cross Cemetery, Colma, San Mateo, California. On September 2, 1882, the California Voters Registration states that August and his family are living at 1420 Broadway in San Francisco, he is 45 years of age and listed as a Post Office Clerk. Since the family is listed on Maud’s Affidavit of Birth as living on Broadway in San Francisco, this may be one of the places that August lived the longest. On July 2, 1883, a daughter, Pauline “Lena” Catherine Mueller was born in San Francisco, California. Her father August, was 37 and her mother, Katherine, was 24. She married Edward Elliott Lund in 1914 in California. During her marriage, she had one child also named Pauline who was born on September 4, 1917. She died from complications of childbirth on September 4, 1917, in San Francisco, at the age of 34, and is buried in Olivet Memorial Park Cemetery in Colma, San Mateo, California. Later on, young Pauline went to live with Gustave Muller’s family in Richmond, California. I suppose in 1883 this would have been a silly concept to alkali farmers, but as we know today, alkali neutralizes acid. In making soap, two alkalis are used: sodium hydroxide (caustic soda) and potassium hydroxide (caustic potash.) Alkali is even in chocolate! Any of the farmers who did bag their alkali and send it to San Francisco would have been prosperous. When George Mueller (Muller) was born on May 6, 1886, in San Francisco, California, his father, August, was 40 and his mother, Katherine, was 27. He married Olive Nicholson on November 10, 1909, in San Francisco. He had no children from his marriage. He died on November 9, 1947, in San Francisco, California, at the age of 61, and was buried in Cypress Lawn Memorial Park, Colma, San Mateo, California. Through the U.S. Census and Voter Registrations, we find that like his military life, August and his family moved quite a bit. On October 7, 1886, August is in the San Francisco Voter's Registration as being 40 years old and living at 442 Duncan in San Francisco. He is still a clerk in the Post Office. On September 10, 1892, August is listed in the California Voters Registration as being 46 years old. He is still a Postal Clerk and is living on 209 Diamond Street in San Francisco. On June 30, 1896, August is listed in the California Voters Registration as being 50 years old. He is still a postal clerk and is living on 3935 Eighteenth Street in San Francisco. On July 1, 1898, August is listed in the California Voters Registration as Carl Ferdinand August Mueller and is 53 years old. He is still working as a postal clerk in San Francisco. His hair is gray and he is listed as being 5 feet 5 1/4 inches tall. He is living at 3935 Eighteenth Street in San Francisco. In the 1899 U.S. City Directories, August is living at 3935 Eighteenth Street in San Francisco. He is 54 years old. The direct descendants were able to find through the San Francisco Library, the Crocker-Langley San Francisco directory for the years 1900, 1901, and 1902. In 1900, it shows that August is still living at 3935 Eighteenth Street; however, so is his son, Gus, who is a tinner at the Lewis E. Spear Co. In the 1901 directory, it shows that August and his son, Gus, are still living in the same location. However, August is now a clerk for Harold Philbrick, an owner of a retail cigar store. His son, Gus, is now a plumber with Lewis E. Spear Co. In 1902, August and Gus are still living at 3935 Eighteenth Street in San Francisco; however, August is listed as "Cigar", which can mean that he is still a clerk in the retail cigar store. In the 1903 directory, neither August or Gus are listed. However, the 1904 California Voters Registration, shows August as living in San Francisco at 323 Castro Street; and in the Crocker-Langley San Francisco directory, both August and his son, Gus, are living at the same address. August is now 58 years old and Gus is a pipe fitter. From 1905 through 1908, August and Gus are not listed in the Crocker-Langley San Francisco directory; however, August's son, George, is listed as a painter and living at 4114 Seventeenth Street in San Francisco. According to August’s death certificate, Katherine was living in Point Richmond at the time of his death. In the U.S. City directory of 1917, Katherine Mueller is listed as being a widow and is living with her daughter, Maud Mueller Bauer and family at 89 Groveland in San Francisco. The entire family then moved to 1327 8th Avenue, San Francisco. Katherine outlived all of her children. In 1921, Katherine applied to receive August’s military army pension for when he was in the Indian War. At this time, the direct descendants are trying to verify if Katherine ever received it. In 1945, after the death of her daughter Maud, she continued to live with her son-in-law George Bauer and her granddaughter Frances Bauer until she died in 1947 at the age of 88. She is buried in Holy Cross Cemetery, San Mateo, California with her unmarried granddaughter Frances Bauer who died in 2007 at the age of 92.